Scientists caution spellbound Instagram followers not to emulate Ocean Ramsey. In the midst of winter, with temperatures in Massachusetts down to bitter digits, the prospect of swimming at all, let alone with white sharks, seems far off. 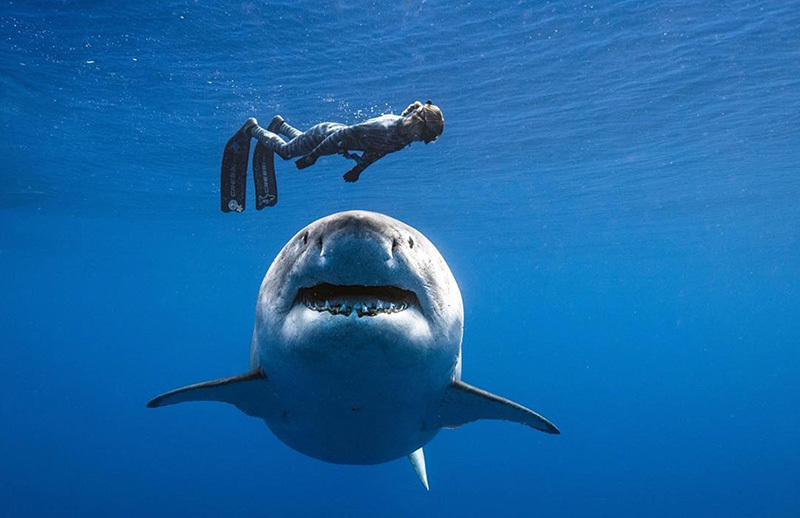 Nevertheless, the commonwealth’s top expert on the giant fish, Greg Skomal, told The Times while it isn’t illegal to swim with white sharks (or any sharks) in state or federal waters, he doesn’t support doing so. 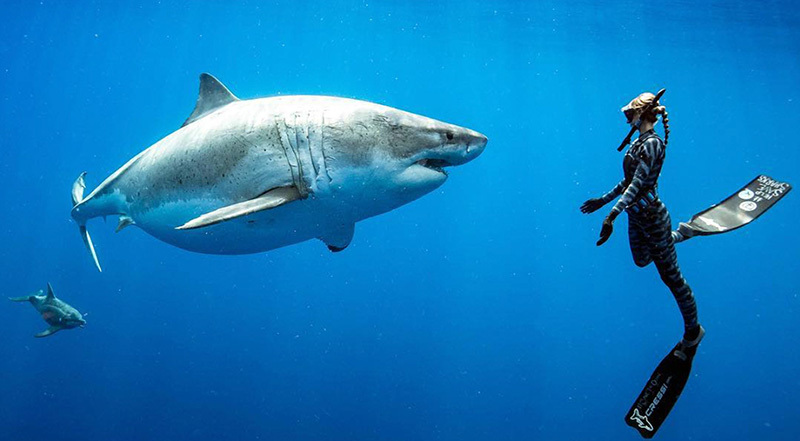 “I don’t think it is a good idea to swim alongside white sharks,” he emailed. Skomal pointed out one thing that is illegal is attracting white sharks, which are more and more common in Massachusetts waters due to robust seal populations. Using chum, bait, or decoys to lure white sharks is against state regulation, as is catching them, he wrote. Skomal has gone on record in the past stating that injuries people have sustained from white sharks in Massachusetts, including the fatal injury in Wellfleet last year, appear to stem from the fish misidentifying people as its food of choice — seals. Purposely attempting to swim with them in often cloudy Bay State waters could be an invitation to be mistaken, Skomal wrote. Ramsey told the Honolulu Star-Advertiser she was part of a research team studying tiger sharks at the site of a dead sperm whale when the shark, which she believed was Deep Blue, the world’s biggest known white shark, cruised in unexpectedly. 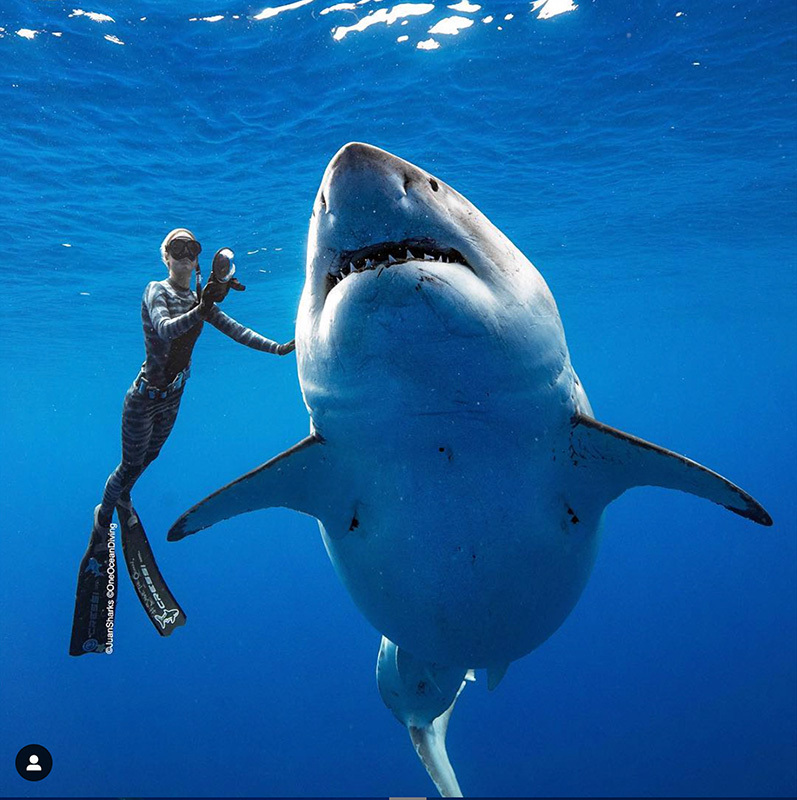 On Instagram Domeier disputed the shark was Deep Blue, and asserted it was Haole Girl, a recent find in the shark world. On Instagram Domeier conceded the shark was likely “very satiated” from whale and “unlikely to bite,” but that Ramsey was setting a bad example. He made reference to Timothy Treadwell, mistakenly calling him “the bear whisper[er]” but getting his fate down correctly — death by bear. Treadwell, a bear conservationist and wildlife author, gained fame at the turn of the 21st century for his fearless close contact with brown bears. In 2003 he and his girlfriend were mauled and eaten by a brown bear in Alaska. “[H]e thought he knew them so well that he was part of their family,” Domeier wrote.